30,000-60,000 honey bees can live in one hive. There are three different types of honey bees that live in a hive; the Queen bee, worker bees and drones. The drones only job is to mate with the queen bee so she can lay eggs. During the Winter, the female or worker bees kick the drones out of the hive and they die. Drones cannot feed themselves, they are completely dependent on the worker bees for survival. Female bees are called worker bees. The worker bees do everything to keep the hive operating. The worker bees bring pollen and nectar to the hive to feed the drones and queen bee. They produce honey from the pollen and nectar. Worker bees store the honey is the honeycomb of the hive. The worker bees must produce enough honey to feed the bees during the winter months. Queen bees can lay 2,500 eggs per day. 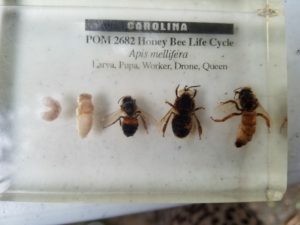 The Queen bee can live up to 6 years. All the other bees live only 6 weeks. When the Queen dies the worker bees raise the new queen. The worker bees choose a young larva or baby and feed it a special food called royal jelly. Royal jelly is a substance that is made in the glands of honey bees. The royal jelly gives the bee the ability to lay eggs. Only the Queen bee can lay eggs. The royal jelly also enables the Queen to live up to 6 years. Only female bees have stingers. The stingers are attached to their abdomen. When a female honey bee stings, they die. Since their stingers are attached to their abdomen, stinging causes their cuts to come out. 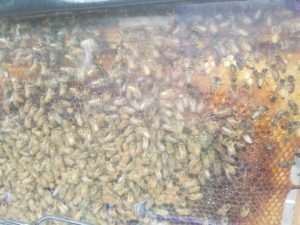 Honey bees are a very important part of our environment. They pollinate the flowers, fruits and vegetables. Pollination is when insects like bees, birds, bats and the wind bring pollen to flowering plants so they can make seeds and grow. They are about ½ inch long. They are a golden yellow color with brown stripes. They can flap their wings 11,000 times per minute! That’s where their buzzing sound comes from. Predators include some birds, mammals and small insects. Larger mammals such as bears have been known to destroy a hive and eat the honey inside. Beekeepers raise bees to collect honey from the hive. Beekeepers wear protective clothing when approaching a hive. Never touch a beehive without protective clothing. Beekeepers will smoke a hive to calm the bees and get the honey. If a bee is close to you, don’t yell and wave your arms. Doing so will scare the bee and they bee may sting you. If a bee is close to you, that means she is investigating to see if you are a flower. Instead of yelling blow a little air towards the bee, like you were blowing a kiss. The bee will think it’s the wind and fly away.